I will look at the following operations on a list in this post. 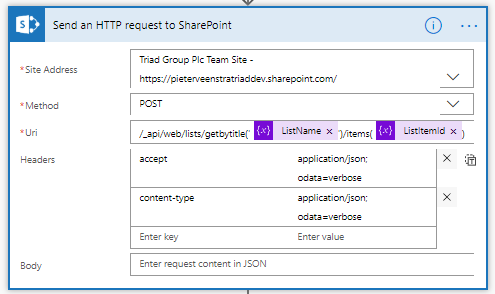 Getting the list item details is easy using the Send an HTTP request to SharePoint action. 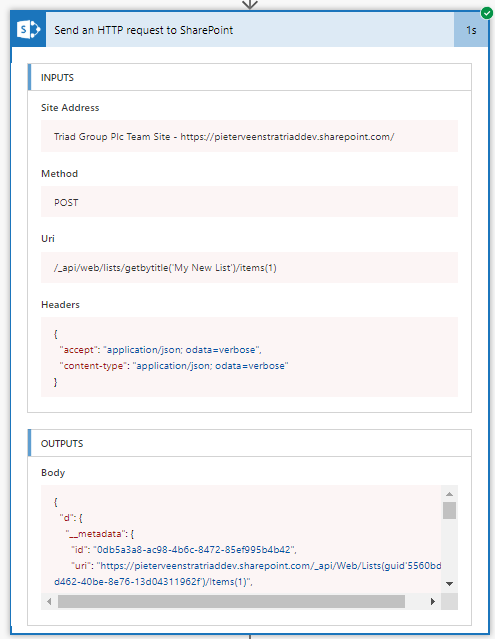 Simply select the Site Address and supply the API uri then supply the body details and a SharePoint coder would be quite happy to create all of this within less than no time. I have found however that no-code developers struggle sometimes. To make all of this easy for no-coders, I’m going to start by setting some variables. First of all you could just use the Get Items action available in Microsoft Flow. 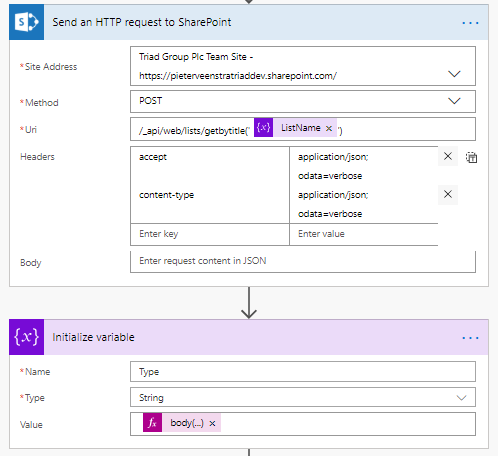 But if you want to get to the more advanced options then the Send an HTTP request to SharePoint action might give you some more flexibility. Note for code developers: You could run the HTTP request with nometadata rather than verbose as that may simplify the output a bit. The Create a list item is slightly more complicated than the examples we have looked at so far. 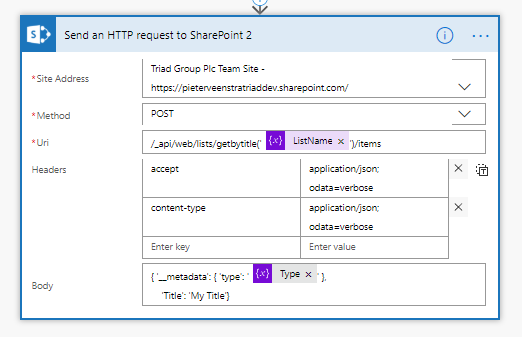 We will need two Send Http request to SharePoint actions. 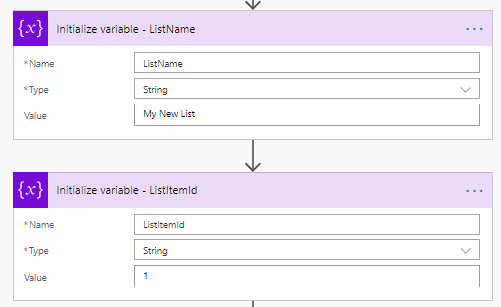 As mentioned on the REST API documentation we will need to get the ListItemEntityTypeFullName first before we can create a list item. How is the body(..) expression constructed to capture the ListItemEntityTypeFullName? It looks like that only allows me to create an item using the default “Title” column. If I try and add a value to the other columns on the list I get a “The property “ColumnName” does not exist on type ‘SP.List’” error. I’ve done a bit of digging and found the ListItemEntityTypeFullName for this list to be “SP.Data.Job_x0020_CardListItem”. If I use that in the body of the “send an http request to sharepoint 2” I can add values to the other columns. I just need to work out now how to get the ListItemEntityTypeFullName from the list programmatically. The intention is this flow will create items on many different sites.